A folding wagon is a versatile and helpful tool to have for work around the house or outdoor activities. They can be used for almost anything you can imagine and can fold up and be tucked away until next time. Whatever purpose your folding wagon will serve, this guide will point you in the direction of the one that’s right for you. You can find folding wagons that are made of steel, and can tolerate very heavy cargo. But those wagons will tend to be heavier. Then there are folding wagons which have heavy canvas-like material that slips onto a metal frame. The wagon will be more lightweight, but will not be able to carry more than 180-200 pounds. Folding wagons are available in either metal or durable fabric. Whichever type of wagon you choose, both options are very versatile for outdoor work, transporting materials, camping, carting equipment along a sandy beach, and much more. Metal Utility Folding Wagons: Metal folding wagons are handy tools for garden and yard work with heavy duty weight capacity and durable rubber tires for rugged terrain. Many metal folding wagons offer detachable sides or adjustable panels to convert your wagon from a basket to a platform. A metal wagon will typically be able to hold heavier cargo. The Giantex All-Terrain Cargo Wagon is made of powder-coated stainless steel, and has a wood railing to keep children and cargo safely inside. The Sunnydaze Utility Cart is made of a durable steel mesh, and has a capacity of 400 pounds. 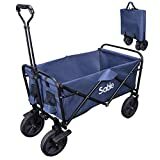 Fabric Utility Folding Wagons: Fabric folding wagons are versatile wagons for transporting any bulky supplies or equipment on smooth concrete or bumpy dirt and sand. Fabric utility wagons fold up to a fraction of their size and are easily stored when not in use. They are ideal for moving heavy loads or carrying many items all in one trip. Many wagon styles offer detachable handles or compartments for extra convenience. Compact: Consumers love the convenience of having a folding wagon with plenty of room for bulky and heavy items, but it still folds up to a fraction of its original size for easy, protected storage when not being used. The highest rated folding wagons take up very little space when when they’re stored away for next time, and many come with a nice cover to protect the wagon when it’s folded up and stored away. The On The Edge Red Folding Utility Wagon (Model No. 900124) can be folded down to 10% of its original size. It can even be packed away in a small bag, so that you can carry it along with you. You can also pack it away in a garage or in the trunk of your car. 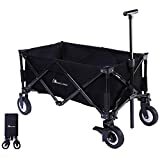 Even folding wagons with an all-metal construction are surprisingly compact: The Sunnydaze Heavy-Duty Steel Log Cart is made from durable steel mesh. It doesn’t fold up like the wagons with a fabric interior, but the sides do fold down, or can be removed completely by sliding out the side pins. Adjustable: Users rate highest the folding wagons with adjustable handle heights so they could easily pull their load at their arm length comfortably and with little physical effort. Some folding wagons offer a removable handle feature for using just the basket portion of the wagon as well. Capacity: Consumers appreciate the high capacity of folding wagons to fit everything you need to transport without trouble and hold over 100 lbs of weight. Metal folding wagons can even hold as much as 400 lbs of weight with ease. Lightweight: You certainly want your folding wagon to be strong--but if it’s too solidly built, it may be too heavy to move around. The Mac Sports Collapsible Folding Outdoor Utility Wagon weighs 24.5 pounds when empty--You’ll find that it’s one of the more lightweight versions. User-friendly: Users give the highest ratings to folding wagons that are user-friendly and easy to work with. They appreciate the wagons that fold and unfold with little effort and require very little assembly for the spare additions to the wagon to have everything ready to go straight out of the box. The Mac Sports wagons are typically easier to fold than the competitors’ wagons. Heavy-duty wheels: Many utility folding wagons have heavy duty wheels for street, sand, snow, grass, or dirt maneuvering. This also makes the wagon durable for navigating over rocks or street curbs effortlessly, while pulling heavy loads outdoors and on rugged terrain. The Serenita Collapsible Garden Cart has 8"-diameter heavy-duty rubber wheels. The Mac Sports Folding Utility Sports Wagon has 8" plastic wheels, upon which there are durable rubber tires. 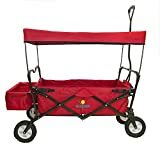 Detachable canopy--The On The Edge Red Folding Utility Wagon (Model No. 900124) allows you the option of attaching a canopy. Since it can hold up to 150 pounds, it can accommodate two small children. The wagon itself weighs 36 pounds. Another brand that includes a canopy is the EasyGo Wagon, which measures 33" L x 17" W x 10" D, and has a rear compartment that is 18.5" W x 8" L x 7" D.
Cup holder for your drink--This is a great convenience if you take your wagon gardening or to the beach. 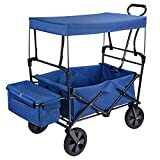 The Mac Sports Collapsible Folding Outdoor Utility Wagon has two mesh cup holders to hold drinks. The Quest Folding Utility Beach Wagon is specially made for beach outings, so having 2 mesh cup holders on the corners to hold cold beverages is an essential. Adjustable handle height, so that you can pull the wagon without physical strain. The Mac Sports Collapsible Folding Outdoor Utility Wagon has a handle that you can raise and lower, and lock into place when you get it to the desired height. Added front or side compartments for extra carrying and storage space. 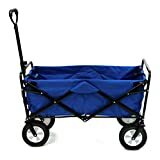 The Creative Outdoor Distributors Original Folding Garden Wagon has side pockets and loops for carrying gardening tools. Rotating wheels: Some wagons offer full 360° range of motion for cutting around corners and navigating rough ground smoothly. Having rotating wheels on a wagon can make pulling items around that much easier with confidence that tougher conditions will not break or damage the wagon. Take note that in some wagons, only the front wheels will be able to rotate 360°, whereas the back wheels will remain locked in position. Width of the wheels: The width of the wheels is also worth noting: Wider wheels navigate better on sand, whereas narrow wheels tend to cut into the sand and sink. That will make it significantly harder to move around on the beach or on sandy terrain. 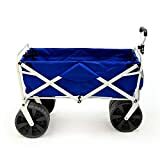 The Foldable Beachcomber Wagon has oversized molded plastic wheels that are 4.14” wide--this distributes the weight of the wagon better when traveling on sand. Height of the handle: Consider the handle height when choosing a folding wagon that is right for you. Taller users will want to confirm the height of the handle reaches to where the arms extend so you can avoid any strain on your back when pulling. Shape of the handle: Take note of the shape of the handle--a round handle gives you a better grip than a “T”-shaped handle. The Mac Sports Collapsible Wagon uses a round handle in its design. A better grip on the handle means that you can maneuver the wagon more easily. Caution--risk of breaking the handle: If you want to make a turn with your folding wagon, some manufacturers suggest first going in a straight line with the wagon, and only then making the turn. You risk putting strain on the plastic connection that connects the handle to the frame--this may make the handle snap off. However, there are folding wagons, such as the Ozark Trail Folding Wagon, where the frame is made from steel--you don’t have the same risk of the handle breaking. Safe for transporting children: If you are selecting a wagon for the use of toting around children then it is important to pay attention to the safety precautions of each wagon and to choose one that is intended for children. This will ensure the lasting life of your product and will be a more comfortable wagon choice for kids to ride around in. 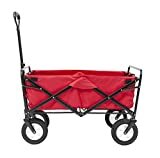 The On The Edge Red Folding Utility Wagon (Model No. 900124) can hold up to 120 pounds, so it can safely accommodate two small children. The wagon itself weighs 36 pounds. Another very good wagon for children is the Giantex All-Terrain Cargo Wagon. It has a base that is made of all-steel construction, and a 20.5”-high wood railing that keeps a child securely inside. It is 34" in length and 15.5" wide, and has a weight capacity of 330 pounds--so strong that even an adult can ride around in it! On the other hand, the Ultimate EZ Ride On folding wagon really accommodates for children: it has two seats--one in each end of the wagon--each provided with seatbelts. Padded for extra comfort: The Ozark Trail Folding Wagon has a pad that fits in the bottom of the wagon. This makes for a more comfortable ride if you put your child or pet in the wagon. You can remove it when transporting gardening tools or heavy cargo. Stain-resistant fabric: Look for a folding wagon made of heavy duty stain and water resistant fabric to help protect it from use no matter the weather or what’s being carted around. Many wagons come in stain resistant fabric to protect the wagon from many uses and keep it looking like new. Mac Sports--was founded in 1993 and has their headquarters in La Verne, California. They are one of the largest manufacturers and distributors of collapsible recreational furniture in the world. Mac Sports, Inc. is focused on growth through innovation and highest attention to quality. The Mac Sports folding wagon is a signature product that can serve a multitude of purposes from beach to camping, picnic to yard work. EasyGoWagon: Offering a wide selection of folding wagons for everything from cruising around with children to packing up equipment and carting it to where you need to go, EasyGoWagon has wagons for every possible need. The company offers hassle-free wagons to make the consumer’s lives more convenient. On The Edge: On The Edge Marketing is a manufacturer and importer of camping and recreational products. 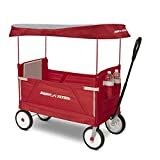 They offer a variety of products for outdoor activities, including the On the Edge Folding Wagon, which offers extra storage compartments, a canopy for sun protection, and 120 lbs capacity. 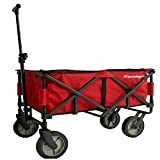 WagonBuddy: WagonBuddy offers a range of folding wagons in varying sizes, colors and specific uses to fulfill any wagon user needs and withstand wear and tear with 120 lbs capacity, durable stain resistant fabric, and compact storage among other features. Creative Outdoor Distributors--is located in Southern California, serving as retailers for a variety of products. They deal in folding benches, chairs, tables, and wagons, as well as appliances, furniture, novelty products, and much more. They sell an expandable utility wagon, with extra-wide all-terrain rubber wheels. It is made from 600 denier fabric, and has dimensions 20" H x 42.5" L x 19.5" W when open. It folds easily, and can fit in most car trunks. It is suitable for gardening, home improvement, and more, and has side pockets and loops for carrying tools. Sunnydaze Decor--is a folding wagon marketed by Serenity Health & Home Decor. They make fountains, outdoor living products, and relaxation products. Their headquarters is in Eau Clair, Wisconsin. One of their products is the Sunnydaze Folding Utility Wagon Garden Cart, which is especially suited for gardening purposes.